Rebecca was a great read, and for next month I think we picked another great book. It's completely different from the gothic-romantic style of Rebecca - it's a true story about an amazing case. Henrietta Lacks died 60 years ago from cervical cancer, but her cells lived on. Numerous scientific discoveries have been made using her cells, but her family has never seen a penny of the profits. 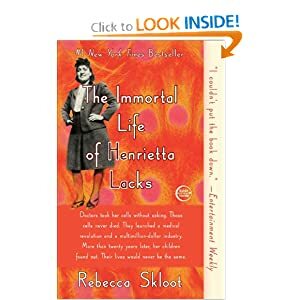 This book traces the life of Lacks' cells, her family today, the scientific discoveries made, and the implications they hold. I am so excited to read this book!